We love it when there’s a buzz about a new author. Thriller writer Mason Cross is picking up all sorts of great reviews for his gripping story of a FBI manhunt for a deranged sniper. Blake hunts for a deranged sniper in The Killing Season – what is it about random killers that so fascinates us? I think we do have a morbid fascination with serial killers. It’s probably because, while we can perhaps understand acts of violence committed in the heat of the moment, the impulse to cold-bloodedly take a human life is utterly alien to most of us. Thankfully, most of us don’t have that faulty gene. A sniper is particularly chilling, because they can strike from afar and you’ll never see them coming. It’s also the only type of cold-blooded killing that can be a legitimate profession: the military will actually train you up and pay you to do it. How do you get inside the head of a man like that? I suspect there may be some crossover in the psychological profiles of serial killers and crime writers; a little more overlap on the Venn diagram than is normal. Again, there’s a grim fascination for a writer in the idea of plotting and getting away with murder, although fortunately for society, we tend to keep our murders on the page. In The Killing Season, I found that writing the villain was similar to writing the hero in a lot of ways: both are very driven, very methodical, very professional. They’re intelligent, capable men doing what they do. Blake would probably make a very good serial killer if he was that way inclined. How did the idea of The Killing Season come about? The initial idea was to pit two equally matched adversaries against one another. A hunter who can find anybody versus a lone wolf who’s adept at evading capture. I was interested in this idea of a very personal one-on-one contest amidst the backdrop of a massive multi-agency manhunt. The rest of the plot developed from that. I read widely about serial killers, snipers, and police and federal manhunts. I read a book about the Washington Sniper case from 2002, and a couple of other books that dealt more with the history of snipers and the psychological warfare aspect of killing from a distance. A book I happened to read on J Edgar Hoover and the birth of the FBI turned out to be unexpectedly useful. I did a lot of local research into the locations I wanted to use. I spoke to my American friends to pick their brains and run ideas past them, and called on my own experiences visiting the States. Perhaps as importantly as any of the direct research, I read a hell of a lot of thrillers, from the old masters to the authors who are in the bestseller charts today. I got to know the clichés to avoid, I stole some techniques I liked, and generally learned to avoid some of the common pitfalls. It’s interesting that the core elements of what makes a great thriller haven’t changed too much over the course of a century. 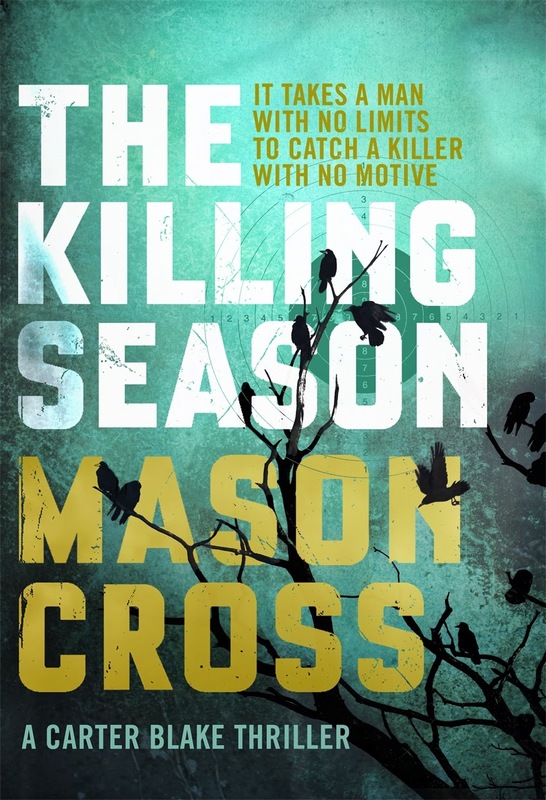 The Killing Season is your debut novel – what was your journey to getting published? It involved a huge amount of luck! I’d been submitting stories to various magazines and competitions for a few years with occasional success. My story ‘A Living’ was published in the Quick Reads Sun Book of Short Stories, which encouraged me to keep at it. Some of the stories I posted on Harper Collins’s Authonomy site. A few months later, they got in touch to tell me that an agent, Luigi Bonomi, was interested in getting touch with me based one of the stories I’d posted. I was sceptical at first, as it sounded too good to be true. But when I did a bit of Googling, I quickly realised that not only was Luigi the real deal, he was one of the top agents in the business. Luigi and his colleague Thomas Stofer were really encouraging about my writing and suggested I develop a novel. Fast forward a couple of years and we were ready to send The Killing Season out on submission. Fortunately for me, Jemima Forrester at Orion read and loved it, and they offered me a deal. I was particularly pleased about signing with Orion because they have such a great track record on thrillers, and publish so many of my favourite authors. I have a day job, so I normally have to fit the writing in around my other commitments. Luckily, I’m able to do that fairly easily – I’ve trained myself out of the habit of sitting around waiting for divine inspiration. I can write anywhere: planes, hotel rooms, cafés, pubs, libraries, park benches… I’d say my ideal writing environment is actually a quiet train carriage with no wifi. I would be unbelievably productive if I lived on a train. Too many to mention them all, but off the top of my head I’d have to include Lee Child, Michael Connelly, Raymond Chandler, Michael Chabon, Ian Rankin, Neil Gaiman, Stephen King, Tom Wolfe. All of the above have one thing in common – it’s a physical effort to stop reading them once I’ve started. Sometimes you have to get rid of the bits of a book you really like, either by editorial mandate or because you know it just isn’t working. It’s tough, but often necessary. The other really difficult thing for me is, once I’ve got what I think is a reasonably finished version of the book, to let anyone else read it. That’s the most terrifying moment, because you’ve spent months flitting between thinking the book is fantastic and thinking it’s terrible, and you know you’re about to get an outside opinion on exactly where it falls on that scale. Generally pretty well, as long as it’s someone who knows what they’re talking about. I’m possibly unusual in that I quite enjoy the editing process – stepping back from the book, messing about with it, deciding what works and what doesn’t and reassembling it so that it runs as smoothly as possible. I’m lucky to have an agent and an editor who both have excellent instincts about what makes a thriller work. It’s rare that what I’ve written can’t be improved by listening to some knowledgeable advice and having another go at it – it’s always better after a rewrite. I also like to get reviews from readers – a book either works or doesn’t for someone, and it’s useful to know why in either case. Friends, family, work, travel, death, love, children, good experiences, crappy experiences – it all feeds in. Another writer told me it’s essential to have spent some time doing a regular job and having a life before you can be a writer, and I’d definitely agree with that. It all comes down to writing convincingly about people and places, and to do that you need experience of as many different kinds of people and places as possible. Keep going. Try to write every day, even if it’s only 500 words. Finish things. Invest some time in plotting, but be open to change – it’s important to have a path from which to wander. The internet should be avoided during writing and embraced during research. And read a lot! Everybody says that, but that’s because it’s true – not just to learn from the best, but to learn why some things don’t work so well so you can try to avoid making the same mistakes. What’s your best advice for an author looking to get into the marketplace? Be lucky! I’d definitely recommend trying to get an agent, as mine has helped me so much beyond the usual business of dealing with the publisher; giving me support and encouragement and invaluable feedback on early drafts. Think about the market, but try not to over-think: don’t write something you don’t like just because you think it will be marketable, because it probably won’t end up being very good. Play to your strengths. Try to be pleasant to work with and professional – it only started to happen for me when I began treating writing as a job. Read a lot. Right now, I’m really looking forward to launching The Killing Season at Waterstones in Glasgow and doing the whole reading and signing thing. The next Blake book – called The Samaritan – is just about done (there’s an excerpt in the back of the first book) and I’m thinking a lot about book three, where we’ll learn more still about his shadowy past. Aside from that, I’m really excited that one of my stories is going to be published in a forthcoming issue of Ellery Queen, which was one of my long-standing ambitions. I’m going to be on three panels at Crimefest in Bristol, and I have a couple of other festival appearances later in the year that I’m not allowed to talk about yet. When I get the okay, I’ll be sure to let people know at my blog. This entry was posted in Authors, The Intel Interviews and tagged Carter Blake, Crimefest, Ellery Queen Magazine, Ian Rankin, Lee Child, Luigi Bonomi, Mason Cross, Michael Chabon, Michael Connelly, Neil Gaiman, Raymond Chandler, Stephen King, The Killing Season, The Samaritan, Tom Wolfe on April 30, 2014 by Crime Thriller Fella. I was saying the same thing this morning to someone, Carol. His answers are absolutely terrific! Thanks both, I had a great time with these questions!